The surprise expressed by the most highly-placed officials in our government—I’m looking at you, Tim Geithner—rings as hollow as that expressed by the Bush administration when the market collapsed last September. It has since come to light that government officials and finance executives worldwide were on record warning of this catastrophe, and urging preventative action, well before the Fall. Assertions by the Bush administration that the economic crash caught them by surprise are as demonstrably false as their claims following another September catastrophe, seven years before, when they told us they had no inkling that terrorists were planning a massive attack on our soil. As we learned later, there was advance warning from credible sources (like FBI agents)—the Bush administration just chose to ignore it. They apparently did the same with the collapse of the financial markets. The problem is, under modern capitalism, it might not be possible to open the poke—at least in some transactions. There are two reasons for this: information asymmetry and systematic risk. The first issue is a consequence of living in complex societies with intricate divisions of labor. The specialization enforced by that kind of social structure makes it increasingly difficult to evaluate anything we buy, and increasingly necessary to take things on trust. Consider the recent problems with melamine contamination of dairy products from China: until consumers started getting sick and dying, there was no way for anyone to know that the products were dangerous. In the context of financial markets, the Enron and WorldCom cases taught us that even the most diligent investors—the ones who read all of a firm’s financial statements, right down to the footnotes—can’t really know what they are buying. 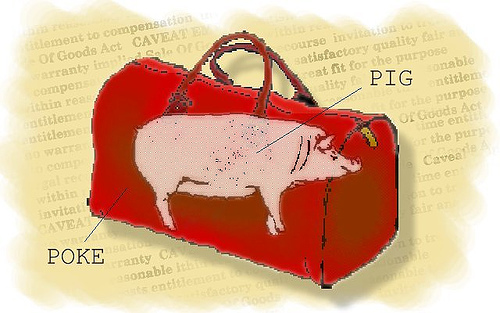 In the case of the contaminated dairy products, only the producers knew about the melamine; in the cases of financial corruption, only the corporate executives knew they were “cooking the books.” Like the medieval con artists selling bags of wriggling cats as “suckling pig,” the sellers withheld crucial information from buyers, and exploited the information asymmetry for profit. But unlike the hungry “pig” buyers who could have opened the pokes to check the merchandise, there was no way for the buyers in these contemporary cases to know what they were really getting. They just had to make the purchases on faith, a faith placed in part in institutions to whom we have delegated the monitoring and sanctioning functions on which trust is based. Those institutions failed us—how they did so is the subject for another post, but the larger theme here is that part of what we’re seeing in the “bailout fallout” is a consequence of the buyers (the taxpayers who are footing the bill) being structurally unable to overcome the problems of information asymmetry. The second problem, systematic risk, is the intrinsic risk underpinning any transaction, from a simple barter exchange to investing in complex financial instruments. This is the kind of risk that remains no matter how much information one has, how much insurance one buys, or how much one diversifies. Imagine you need change for a coin-operated washing machine, and you call your next-door-neighbor to see if she can give you four quarters in exchange for a dollar bill. What could be more transparent? You know your neighbor, the currency is standardized, and you have no reason to expect that she might be counterfeiting 25-cent pieces. But there are still many ways the transaction could fail, for reasons you could not foresee: for example, as you’re walking across the street to make the exchange, your neighbor drops dead of a heart attack brought on by an undiagnosed arrhythmia. That’s a systematic risk—in the broadest sense, it’s the risk we take by assuming that we and our transaction partners will live to fulfill our agreements with one another. In the financial world, systematic risk could come in the form of an outbreak of war or a pandemic, or what are often termed “acts of God” in the fine print of insurance contracts. As a result of both systematic risk and information asymmetry, both of which are inherent in economic life, we end up buying pigs-in-pokes, faute de mieux. There is nothing else to buy. Capitalist development has colonized the life-world so completely that even if one was able to withdraw from social life and stop making transactions with others—living in isolation, off the grid, providing for all one’s own needs—these risks are still unavoidable. You might find that the plot of land where you grow your food was poisoned by a previous owner who used synthetic pesticides or stored toxic substances underground; if you’re lucky enough to avoid that hazard, you could still be wiped out by anything from a roving grizzly bear to a nuclear strike. These things are not in our control. Yet we still get up every day and buy more of those wriggling sacks, hoping that whatever eventually jumps out resembles what we thought we were buying. From this perspective, the bailout, like the case of Long Term Capital Management a decade before—that was the hedge fund that demanded that investors fork over a minimum of $10 million, with no questions asked about the fund’s plans or investment strategy—is just an extreme case of “normal” everyday practices in which we all engage within complex capitalist societies. This is simultaneously reassuring and terrifying, because it suggests that the global economic crisis is not an anomaly, but literally the new business as usual. Unfortunately this means that, as with “extreme weather events” like Hurricanes Katrina and Gustav, we can expect more of the same in the years to come. Lacking any words of optimism or consolation, I can only offer some distraction: the sweet revenge of the poked pig. UPDATE: For an absolutely hilarious mash-up of classical and contemporary drama (Aeschylus meets AIG), check out Kieran Healy’s send-up of Agamemnon. 1. The whole deal is rather galling to those of who can’t get paltry sums from the federal grant-making agencies without a detailed proposal up front, and expense and status reports afterwards to keep us accountable. An ancient Greek tomb of a dog, Stephanos, from the archaeological museum of Antalya, Turkey. Visiting a museum in the Turkish city of Antalya a few years ago, I was startled to find–among the Greek and Roman sarcophagi–the tomb of a dog. The monument, for a dog named Stephanos, was discovered near Termessos in 1998, not far from the inscribed sarcophagus of Rhodope herself. The epitaph on Rhodope’s tomb–written in ancient Greek, like the one on Stephanos’ monument–states that she paid for her grave marker entirely by herself, which suggests that she was single. And wealthy. Data from American Pet Products Association market research. No data were available on expenses for sarcophagi, but animals seem to be playing a part in the economic surge of the American funeral industry. A simple pet cremation starts at $185, with additional charges for a burial, procession, and grave marker; apparently, one bereaved “pet parent” (the preferred term in use by funeral directors) paid $5,000 for a bronze sculpture of the deceased to mark the dog’s grave. Which brings us back to Rhodope, a woman of the ancient word, and her beloved dog Stephanos. And buried me like a human. And Rhodope set up a tomb for me. The sight of Stephanos’ tomb was so moving, because so unexpected: I had never heard that the ancient Greeks buried their dogs (or other animals) with sarcophagi and poems. 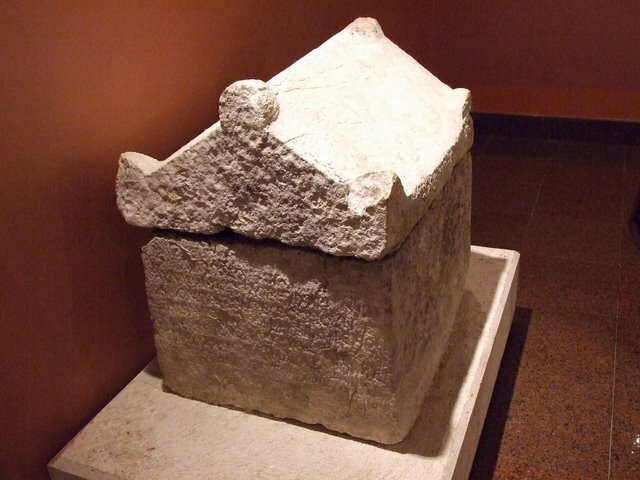 But a little poking around on the internet revealed that the tomb of Stephanos was far from unique, but rather on the more elaborate end of a spectrum of such practices. Laugh not, I pray thee, though it is a dog’s grave. But now his voice is ‘prisoned in the silent pathways of night. And splendid Ossa and the lonely peaks of Cithaeron. 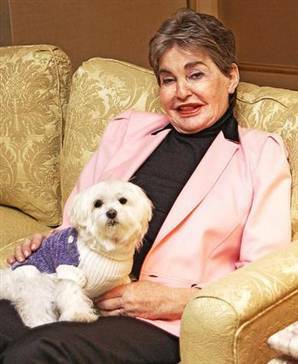 All this love and expenditure directed at dogs reminded me of Leona Helmsley, the wealthy American businesswoman who left the bulk of her multi-million-dollar estate to her white Maltese, Trouble. When Helmsley died in August, 2007, she had four living grandchildren, two of whom she left nothing; the other two received $10 million each. But Trouble–the dog notorious for biting everyone except Helmsley–got a trust fund worth $12 million, and the right to be buried in the Helmsley mausoleum next to Leona. Helmsley’s brother also received a bequest of several million dollars–to pay for his services as Trouble’s primary caregiver! Leona Helmsley and Trouble: a modern Rhodope and Stephanos? I had to wonder why we never seem to hear about such extravagant expenditures on animals other than dogs. Where are the monuments to the faithful and affectionate rabbits? Or to the long-lived and highly-intelligent African grey parrots? Maybe such memorials exist, but since there are so many more dogs living with humans compared to other kinds of animals (75 million as of 2008, in the US alone), that when we read about funerary monuments for pets, odds are that the story will concern a dog. Your thoughts? To see more on the sociological study of human relationships with animal companions, click here.